Office 365 is Microsoft’s App suite and cloud collaboration tool. This platform includes Office Online, OneDrive and Outlook.com. Outlook.com is a personal email service with a modern and intuitive interface, keeping your emails tidy and your contacts up to date by linking with Social Media such as Facebook and Twitter. Important integrations, such as with Skype and the Windows phone, make it easy to switch to a call with one of your Office 365 contacts and make changes on the go. Find out here how to use these native integrations to your benefit while using PieSync, we also have an interesting read on our blog about this! We sync with Outlook 365, which is the cloud-based version of Outlook. Please check if your local Outlook is in sync with Outlook 365. If your local Outlook contacts are available here, you can start using PieSync! Non-Migrated Outlook.com accounts (Hotmail/Live/Msn or no REST API. What about GAL & Public folders? You're able to incorporate these in your Piesync connection via Cirasync. More in-depth info can be found here. For Office365 Outlook.com, we need you to log in to your account, and validate permissions. If you already authorized Outlook in the past or in any other PieSync integration, you'll be able to skip this step and choose from your CONNECTED ACCOUNTS. Important notice: Outlook contacts can only exist in 1 folder at the time. Our Outlook connector checks all the contacts across different folders and will not move contacts to another folder when specified in the rules. Example case below. The contacts that already exist in SyncPie, will be mapped together to keep them in sync. 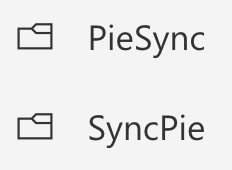 However, they will not be moved to the PieSync folder as specified in the rule above, as this would imply creating a duplicate contact (= existing in both PieSync AND SyncPie). Workaround: If you expect our engine to create "duplicates" of the contacts in the PieSync folder, our Exchange connector is the way forward. Our engine will keep the contact up to date, specified in your rule (and not both). Outlook's contact records are very data rich and offer ample fields to store contact information. Depending on the other app you're syncing with, a default mapping is proposed. This could look like this, if you want to make a sync with Hubspot. If you're expecting Outlook fields to appear here and they are not, it is likely the other app does not support this field by default. You can custom map your Outlook Contacts fields that aren't included in the default mapping yet. Bear in mind a mapping between two fields can only exist if the types of fields are compatible. More information on Customizable Field Mapping. Office365 Outlook.com does not support custom fields. The availability of this feature is app and connection dependent. Unfortunately we do not support syncing deletions/unsubscribes at this time for Outlook.